She’s a self-confessed ocean-addict with a surfboard leash permanently in her handbag, sand in her bed and a fixation with wind guru. She’s Diony Lalieu who only started surfing at 29, made it to SA champs at 41 and is now the Soul Surfer Ocean Watch Ambassador and the founder of the Surfer’s Pledge. 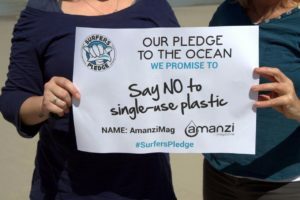 Amanzi Magazine met with this go-getter to find out what motivated her and more about the Surfer’s Pledge. She chose to enter surfing competitions because competitions were awkward. Diony came 4th in the SA Champs senior ladies’ category. She remarks: “I was listening to John Charter, the CEO of the Human Elephant Foundation, at the Opening Ceremony at SA Champs when my whole body started resonating. I knew I was there for another reason.” That reason unfolded right then and there and after submitting this poem as part of her entry, she was chosen as an Ocean Watch Ambassador for Roving Reporters. “This is an exciting environmental journalism programme supported by several conservation agencies including Wildlands and the Blue Fund – a Grindrod Bank marine conservation initiative. As Ambassador you must live up to leading an exemplary ocean lifestyle. Stepping into my fear just opened up so many channels,” continues Diony. 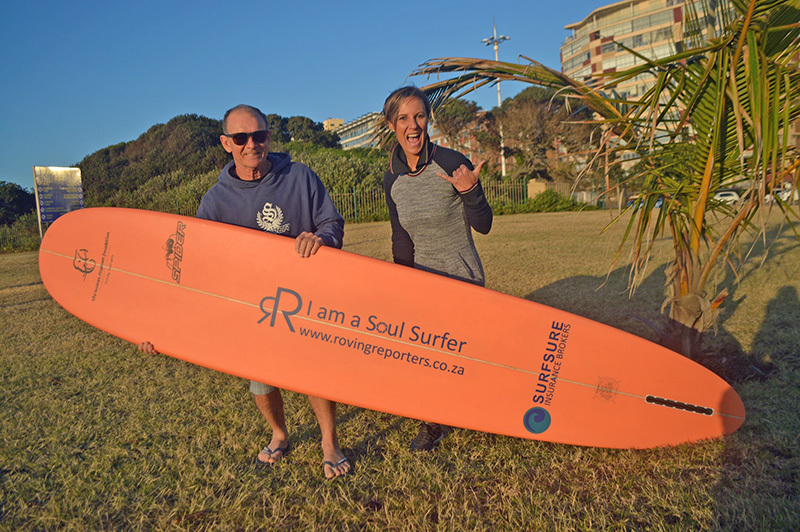 She’s humble too, because what she didn’t tell us was that soon after being chosen as an Ambassador she won the Roving Reporters 2017 Soul Surfer Award winning a Spider Murphy longboard co-sponsored by Surfsure. 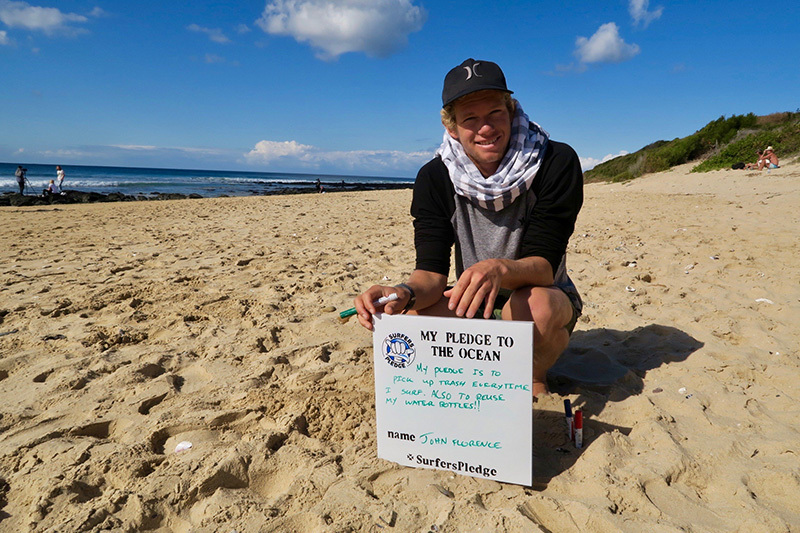 Another good reason why Amanzi Magazine takes the Surfers Pledge with SA’s own ocean watch ambassador. 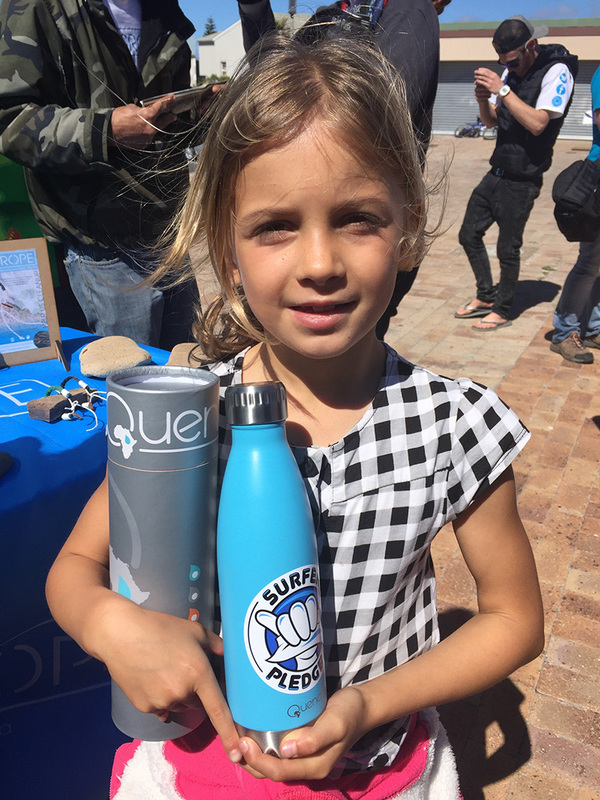 While at the Durban SA Champs, she noticed all the plastic water bottles being shipped in daily. “I was shocked. It seemed so ironic considering this was a beach event and that plastic bottles are #4 in terms of big ocean pollutants.” She admits that ‘plastic campaigning’ is her second addiction. This is when the idea to start Surfer’s Pledge originated. Surfers Pledge is about harnessing a community of surfers, raising awareness around critical issues affecting the ocean and empowering a more conscious consumer. 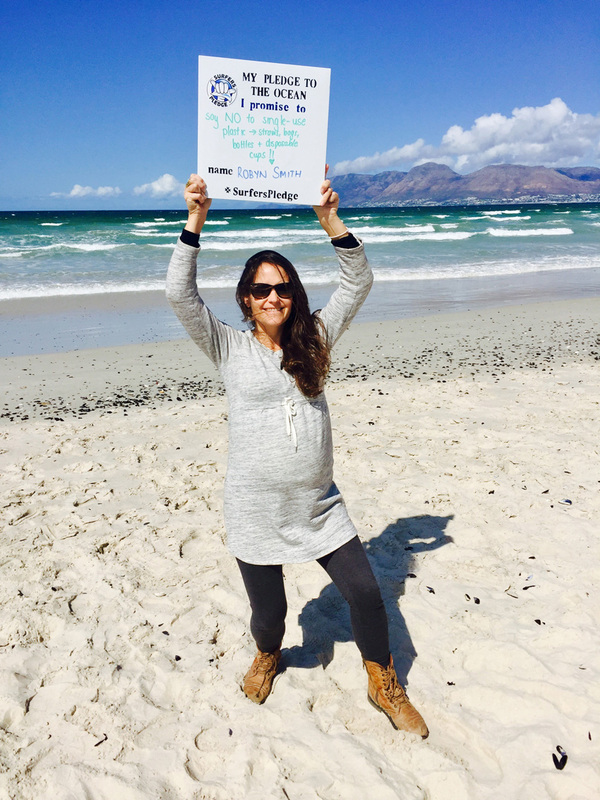 The pledge is a challenge to start being the change you want to see by making just one promise to the ocean. Roving and reporting, Diony has met some inspiring campaigners who are doing their bit for the planet. Such as We Care Collective who promote the use of bamboo straws and the amazing initiative of Plantastic who upcycle plastic into exquisite products like bangles and donate a portion of their profits back to the Two Oceans Aquarium. The Big 4 represent 60% of all plastic used and are part of the top 10 ocean pollutants. They are also all ‘single-use’ plastics. They take a whole lot of energy to make and we only use them for a few minutes. So, none of them are necessary. “Humans are creatures of habit. It’s not that we have bad intentions toward the environment, quite the contrary. However, because of habit, we often fail to question whether what we purchase is even necessary. So, what it boils down to is #1: Recognising the habit in the first place, and #2: Breaking that habit to make place for new ones. And to create a new habit you only need to repeat a new behaviour 47 times.” Diony maintains. South Africans use 8 billion plastic bags per year. That equates to around 416 bags per person per annum. Can you just imagine what 416 bags looks like to one sea creature? While the plastic bag tax implemented by the SA government helped for a while, the added costs got absorbed in the costs for living, and the funds generated, which were meant to benefit various recycling schemes, ‘disappeared’. So ultimately the price you pay per bag certainly does not benefit the environment. According to this IOL article: The plastic bag levy has proved to be lucrative for the government and retailers: according to the latest available statistics, R1.1 billion was collected by the state between 2003 up to the end of August 2014, in addition to about R5 billion charged by retailers and suppliers. Every single hour around 250 000 disposable water bottles are dumped. One water bottle takes 700 years to decompose in landfill. Water bottles kill an average of 1 million sea creatures a year. With SA’s coffee culture booming and here to stay, we use a staggering 1 billion plastic-lined cups and lids every year. Styrofoam cups are the ‘bad boys’, as they take 500 years to decompose. This fact is simply mind-blowing. The volume of straws disposed of in the USA in just one day is enough to wrap around the earth from end to end twice! And that is exactly what straws are doing to our environment – strangling it. • An estimated 6 billion plastic straws get used a day. • Plastic straws are the TOP 10 litter found on beach clean-ups. • Chemically made-up and releases toxins when re-used. • They take 200 years to decompose. • Precious fossil fuels are used to make and distribute them. • McDonald’s alone uses 60 million straws DAILY worldwide. Diony’s love affair with the ocean started when she used to swim with her mother at 5am in their hometown of Port Elizabeth. She often found herself surrounded by dolphins. She was born in Marbella Spain and could virtually swim before she could walk. She has her Master’s degree in Research Psychology. “Over the past 14 years I have worked for multitudes of large corporate brands. Through this experience I have been daunted by the relentlessness of consumerism and the devastating impact it has on our planet,” she adds. On a personal note she feels that she has a moral obligation to teach her children to care for the planet, so that this ethos can live on through the generations. When she talks about surfing it’s like she’s describing a choreographed ballet piece. “Long boarding for me is like dancing on the ocean. It’s gentle and graceful. It’s a thrill to ride the energy of the waves,” concludes Diony. Diony, a dynamic and energised 40-something mother of two, exudes pure passion. It’s blatantly evident that this crusader has found her true calling. Her energy is palpable and will undoubtedly continue to inspire this movement as she makes instrumental waves in marine and environmental protection. We salute her. Amanzi Magazine takes the Surfer’s Pledge with SA’s own ocean watch ambassador and challenges our readers to do the same. 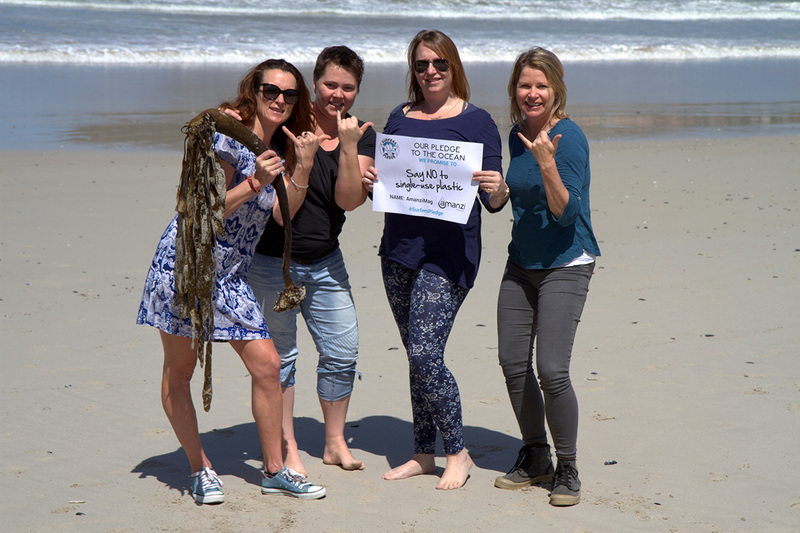 The Human Elephant Foundation subsequently sponsored her attendance of the World Whale Conference in June and the recent Ocean Stewards Science Session at the University of KwaZulu-Natal. Diony was also enrolled on the UCT-Getsmarter Feature Writing Course and is now a Roving Reporters’ Ocean Watch correspondent based in Cape Town. What a great concept – we should all be reducing our plastic use. Let’s all #pledge to #reduceplastic!